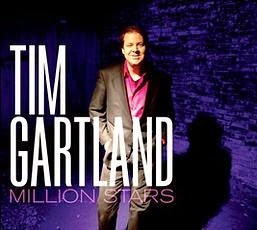 I just received the newest release (September 9, 2014), Million Stars, from Tim Gartland. Having more of an R&B attack on the blues, Gartland, joined by Tom West (Keys), Chris Rival (guitars), Paul Justice (bass) and Forrest Padgett (drums) present a very smooth soulful set. Opening with Let Me Keep The Dog is a well balanced track showcasing Gartland on harp and vocals, his voice being somewhat stark and interesting. Off Of My Mind is an upbeat track sounding a bit like a Billy Preston track (rhythmically). Again, Gartland has a real nice voice for the style of music and organ work by West supports the body quite well. Gartland's vocals have been compared to Jimi and on Mess Me Up, the phrasing and timbre do sound similar. A cool track with airy guitar riffs this track has a nice texture and a nice bridge featuring West and Rival on solos. When The Next Wind Blows has a funky rhythm and a cool bass line by Justice. Talking about universal appeal, this would be the track. Gartland lays down a nice harp solo and West plays a nice piano sounding quite like Randall Bramblett in style. I Should Have Cared Less is one of my favorites tracks on the release with a rich spiritual feel. Accentuated by nice organ and piano work from West, this track just has that something special. Two Rights Make A Wrong is built along the lines of a Curtis Mayfield composition with strong but neutral organ work. Rival plays some very clean jazzy style guitar riffs making this track stand out even more. Better The Foot Slip has a bit of modern southern funk rock. Again, vocal phrasing makes you think briefly of Jimi but the warmth of the organ keeps you in line. Another of my favorites, this track gets a really nice groove. Gartland plays some Johnathan Edwards like harp work, keeping it easy but cool. Title track, Million Stars, resembles Let It Bleed and how could that be bad. With a taste of New Orleans and a taste of country another fun track. Tippin' Time is built around a really nice bass riff by Justice but with nice lead harp work from Gartland. Again Rival steps up with clean guitar riffs and Padgett holds it tight as West pushes you back with powerful organ work. Nice instrumental. Shine Your Loving Light is a solid ballad with clean accompaniment by West on keys. Simple harp riffs and driving clean bass runs add to this simple radio style track. I Can Add had a distinctive Willie Dixon feel and of course solid bass work. The bluesiest track on the release makes way for Gartland to really dig in on the blues harp. West skillfully weaves a nice piano pattern throughout the track as well a a clean solo. Slide guitar from Rival also gives it some grit. Wrapping the release is Shake It Nina, boogie track with a healthy helping of harp and a does of organ over the driving beat of Justice and Padgett.